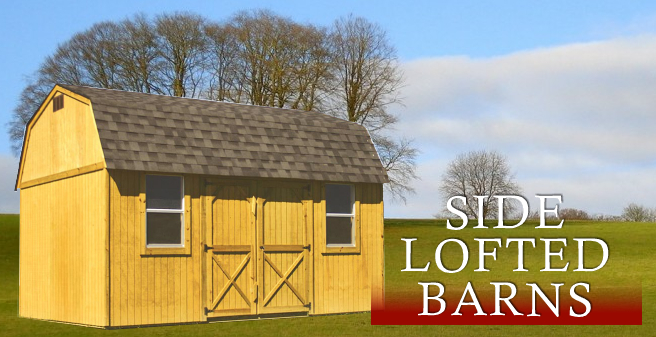 The Side Lofted Barn is available in 8', 10' and 12' widths (14' & 16' widths available in some areas, based on hauling restrictions). The 8'-side model features a single wood door and one 2x3 window. The larger models include a double wood door and two 2x3 windows. All models come with a convenient loft that provides additional upper storage. Metal or Shingle Roof - YOUR CHOICE! Choose a 30 year metal roof or quality, residential grade 30 year shingles, SAME PRICE. Floor joists are 2x6's in 10' and 12' wide, 16 inch on center and set into notched skids to prevent twisting. (Floor joists never span more than about 5 ft without being supported by a 4x6 skid.) Floor Joists are 12 inch on center on all Garages. Not all products, materials and sizes are available in all areas. See your dealer for details. Pay off any time with no penalty. Side Lofted Barns are perfect for animals like horses. Some customers use side lofted barns for storage or utility buildings. They are bigger than utility buildings and make more sense than garages. 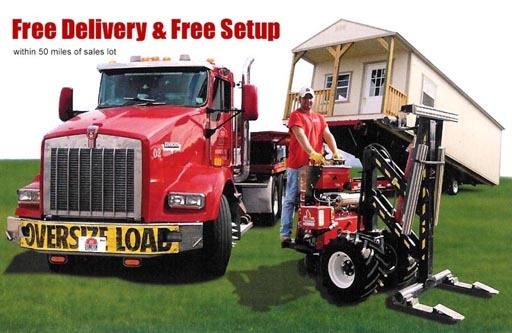 You can buy or rent-to-own. Exposed nails are ring shank and galvanized for maximum strength and no rust spots or stains. The 2x4 reinforced doors are designed to seat out rain and rodents and are key locked for your protection. Series of air vents positioned to create optimum circulation and temperature control. All exposed material is pressure treated. 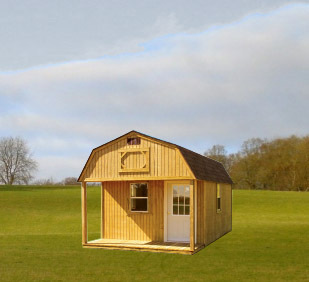 8' and 10' wide barns require $100 deposit. 12' wide barns require $200 deposit. Copyright 2011-2013 © www.derksenbuildingsusa.com All Rights Reserved.